I was standing on Piccadilly Circus and decided to give it a go. I had 50 minutes to get from Piccadilly to Fulham cinema. The bus snailed itself through traffic and rain and London business. I had the premier seat, top floor, first row, and I could see the time running faster than my bus could catch up with. Roadworks on Fulham Road did not make things better. I finally jumped out of the bus. My umbrella struggled a bit for about two seconds, and in those two seconds so much water came down that I was drenched. I wanted to shout, OK! I know I said I love rain, but this is overdoing it! I bought a ticket, Fulham was far from sold out. Hurrah for that. And the friendly box office girl knew how to make me forget my soaking wet shirt. I pinned the badge on my bag. I bought a Coke and a hotdog which was more dog than hot. I had a short conversation with the hot dog girl. Yes – I had seen Waitress too. And yes I liked it. And oh she loved it. 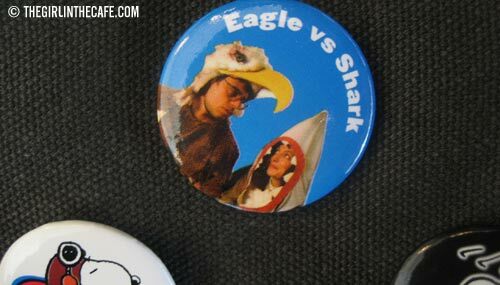 Well catch Eagle vs. Shark then, it’s a rom-com too! She would. I like nice people. The usher kept the door open while I managed to wrangle myself into the cinema with a coke, a hotdog, a bag with a badge, a coat and a dripping umbrella. I learned something though: Trocadero cinema is definitely out now. The people working in Fulham are 100 times nicer, as is the cinema. Quirky! Very very quirky. Funny. Romantic. Goofy. Nerdy. Hilarious. Weird. Original. Lovely. Sweet. Recommended. And the film features the two most unlikely romantic leads I have ever seen. Do you want to kiss? There is someone for everyone .. Apparently. Finding love was never so… Awkward. And that makes even a cynic like me feel good. a hotdog which was more dog than hot.. Funny, surfing the world wide web, for something about the film (The Girl In The Café) I came on this weblog… And I was here before. I remembered being here, googeling for images of Danmark, some years ago, and end up in your gallery of Bornholm. It ‘s the same dutch girl, who first lived in Danmark, isn ‘t it ? Well, anyway, I ‘ve finaly seen the film (TGITC, that is). And I really liked it ! Bill Nighy really plays a moving caracter. I never knew, the film was part of the MakePovertyHistory campaign. by the way; what ‘s Cockie doin’ here ? Now mother… (nou moe…) ik kom hier al jaren..
@Anders – yes that’s me :) Good to hear you like The Girl In The Cafe, too bad the trailer of Eagle vs. Shark put you off, it is a deliciously quirky film. isn ‘t that a little late for still being on the web ?